When we talk about the “conscious mind” we are referring to our present and current awareness. The amount of information we can store at any one time has been limited to seven plus or minus two chunks of information, and under any amount of stress, that number can easily diminish. In relation to the total amount of information our nervous system receives, our conscious awareness receives but the thinnest thread of information. It’s somewhat like saying that consciously you are only allowed to read one book in the entire library and expect that you are receiving all the information you can, which is just not true. Another good way to give you a visual imagine of the difference between the conscious and subconscious minds is imagining that you are in a pitch black dark room and you have a flash light. When you turn the flash light on you can only see where the flash light shines light on, and other than that everything is unknown to you. This beam of light that comes from the flash light represents you conscious mind, and everything that is dark represents what you unconscious mind is processing. Consciously right now we are mistaking the lighted portion of the room for the entire room, and as we now know there is more than that. As said above, your unconscious mind consists of everything you are not aware of consciously and receives all the other information that you do not compute with your conscious mind. Depending on which “expert” you use as a reference, your nervous system may be receiving up to 2 million bits of information per second. All of this information is nearly completely out of your conscious awareness, and in addition to this, everything you have ever felt, heard, seen, tasted, smelled, or thought is recorded in some way in your subconscious. Milton Erickson referred to it as your brain’s “storehouse” of all memories, beliefs, identities, values, and other filters which delete, distort, and generalize all the information you receive. Your Autonomic Nervous System would also fall under the domain of unconscious activity, and this includes sensation, perception, emotional responses, respiration, digestion, and on a microscopic level, the biochemical functioning of all those stated activities, as well as the immune and endocrine systems. So in a way of summing all of that up, everything in the body is communicating with everything else and it’s all happening on a subconscious level, so no matter what you think you are, you are more than that. 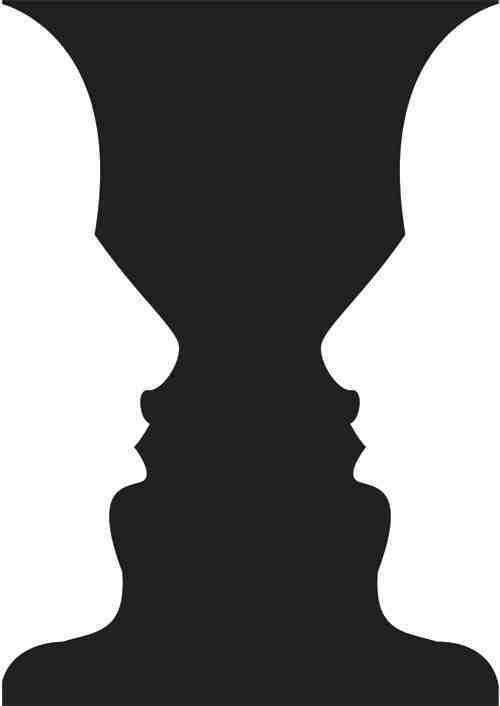 Oh, and just to let you know, that picture in the middle is of a goblet, not two faces, I'm sure your subconscious caught that.... are you?